When the trial team is in the midst of questioning witnesses, cross examining and displaying exhibits, it’s impossible to effectively assess all the behavioral clues happening with the jury and witnesses, as well as other relevant actions happening in the gallery and beyond. That’s where I can give you the courtroom advantage. In my role as Trial & Ayers trial consultant, I debrief counsel before the start and/or at end of each day, during every break, and throughout the day on my assessment of how the wind is blowing surrounding the jurors. Consider it a birds-eye view, offering insight on what I observe to be working and what isn’t, as well as offering ongoing suggestions for ensuring that things stay on the right track. Trial & Ayers attends trial or courtroom proceedings on a daily or ad-hoc basis. I can observe the entire trial from opening statement through closing argument, or only the sections causing you the greatest unease; your choice. Because Trial & Ayers sole purpose is to focus on the jury’s behavior and reactions, I offer a unique perspective to determine what is the most expedient course of action to employ based on current conditions in the courtroom. I use my expertise in behavioral clues to deception, nonverbal communication, body language, and communications of both jurors and witnesses to offer you guidance on important tactical assessments throughout the day. If I determine jurors would benefit from an altered description, such as more elaborate detail, more concise detail, a more rapid delivery, or a demonstrative visual, I’ll let you know. Trial & Ayers provides insight and direction so you can keep your courtroom engagement laser focused. Trial observation is the best way to provide assessment and feedback regarding the visceral reactions of your case while offering practical suggestions for strategic modifications to increase influence. A majority of a litigator’s work takes place outside the courtroom. 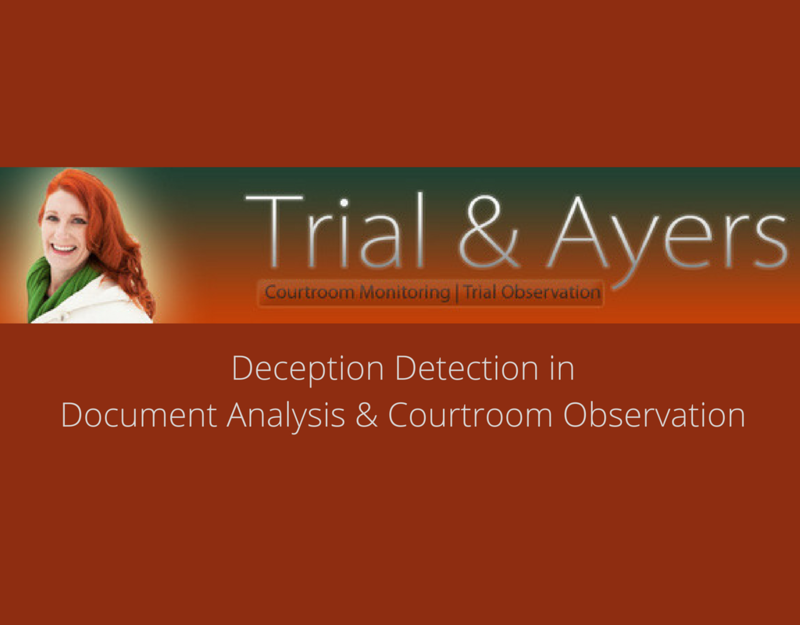 I provide Document Analysis by analyzing motions, affidavits, and exhibits for credibility. With that information you will be better equipped to present your case. You’ll have peace of mind knowing if statements provided are credible or contain deceptive information. By sharing our expertise in juries, courtroom dynamics and communications, we aim to keep the trial team’s strategic direction focused, impactful and relevant. Managing Director, of Concealed Statements, LLC, Laurie Ayers, brings unique knowledge, skills and abilities to the area of courtroom observations. She’s participated in hundreds of hours monitoring trials as an observer and a juror. Read Laurie’s full bio here. Indeed, limited main focus. Many consultant firms offer a variety of trial consultant services. However, because Trial and Ayers’ specialty is document analysis and trial observation/courtroom monitoring you are hiring a dedicated subject matter expert in this area whose attentions are not divided. Ready to Get Results with the Courtroom Advantage? The CONCEALED STATEMENT BAKER’S DOZEN is A Sweet Bundle of 13-Hours to Mix-and-Match Deception Detection Services. Learn more here.